Braising leeks brings out a delicious buttery flavor for an amazing accompaniment to roasted chicken or fish. A perfect side dish for any occasion! 2. Trim tops of leeks, removing dark green portion. Leave the root intact. 3. Remove two outer layers. Starting from about 1” above the root end, halve the leeks lengthwise, again leaving the root intact. Wash the leeks between the layers to make sure all sand is removed. Dry slightly on paper towels. 4. Heat the olive oil and butter in a large, deep ovenproof skillet over medium heat. 5. Add the leeks, season with salt and cook turning occasionally until light golden brown in spots, 5-7 minutes. 6. Add the wine and cook down until ½ liquid is absorbed about 3-4 minutes. 7. Add ½ cup water, chicken broth, thyme sprigs & ½ teaspoon salt. 8. Bring mixture to a boil then transfer the skillet to oven. Bake until leeks are tender and liquid has reduced, about 20-30 minutes. 9. In a small skillet add a teaspoon of oil over medium-high heat. Add the chopped prosciutto and pan fry until crispy. Remove from pan & set aside until needed. 10. In the meantime, whisk parsley, Dijon mustard, and vinegar in a small bowl. Slowly whisk in extra virgin olive oil in a very thin stream, whisking the whole time until you achieve a light emulsified vinaigrette (about 2 tablespoons). Season to taste with salt & pepper. 11. 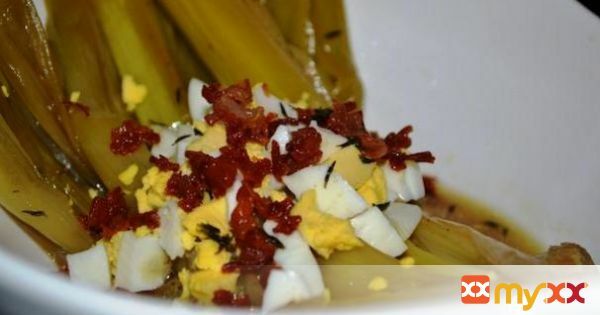 Transfer leeks to a bowl or platter, drizzle with the Dijon vinaigrette, top with chopped eggs and pan fried prosciutto and garnish with leaves from thyme sprigs.